(!) It is very important to know that depending on your membership you can be limited on some things which are set by the administrator like the number of friends, photos and videos added, messages and interactions sent, events, joining or creating groups. Purchasing a Membership Plan can remove those restrictions ! 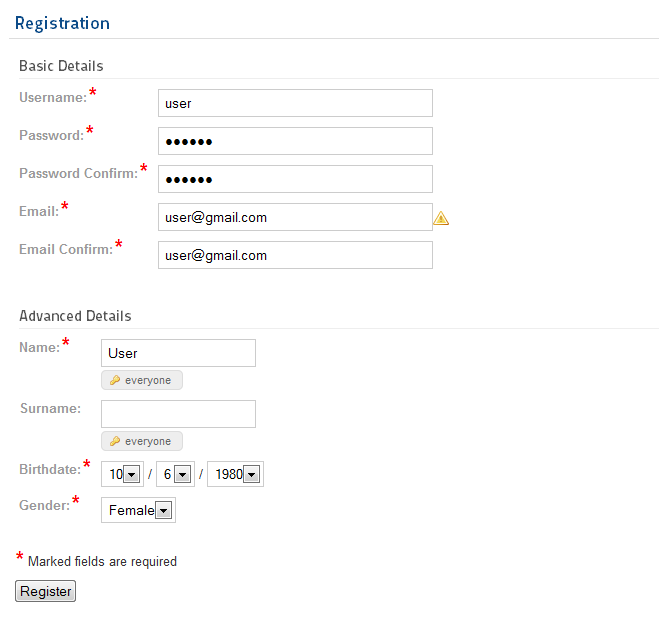 To start, you will have to do create an account, click on "Create an account" on the Login page or module, and add the required details. For this guide we will be using the Social Factory's registration form. First things are the basic account details, write the username, a valid email address and password. 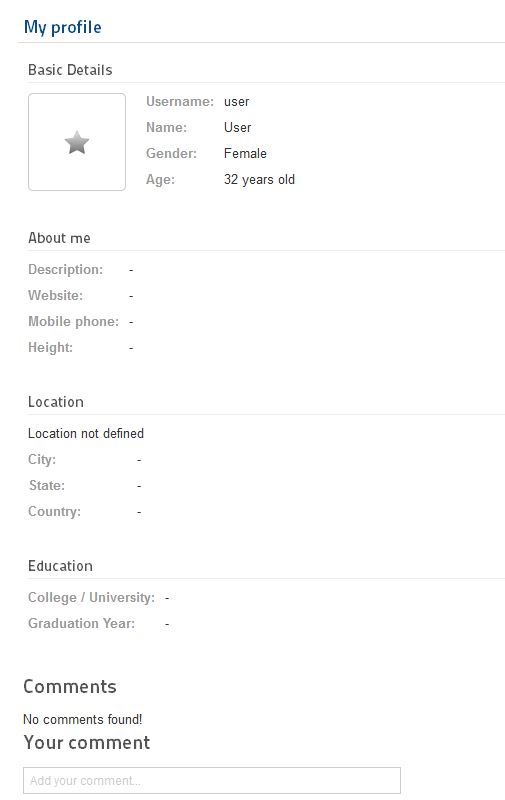 Below these are the advanced details - Social Factory profile specific, the marked fields are required. Here you can add your name, surname, gender (male, female, couple or other) and your birth date. 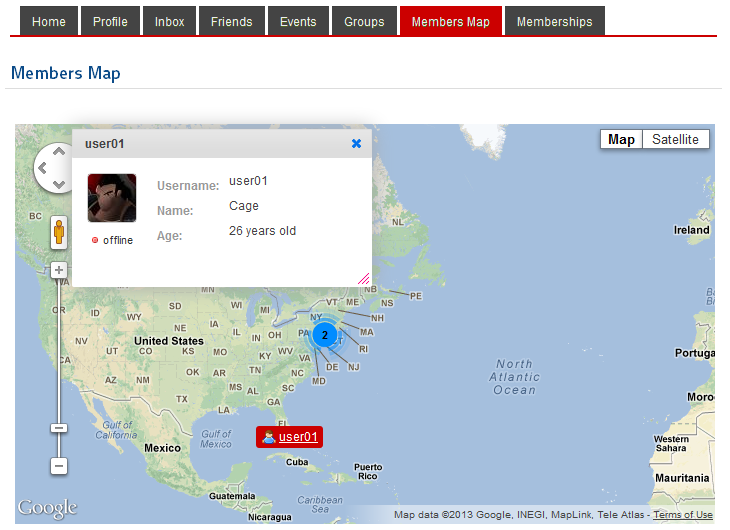 By clicking on "Profile" view your details. Each user can also comment on their profile. This section has 3 submenus, click on Edit to modify your profile details. 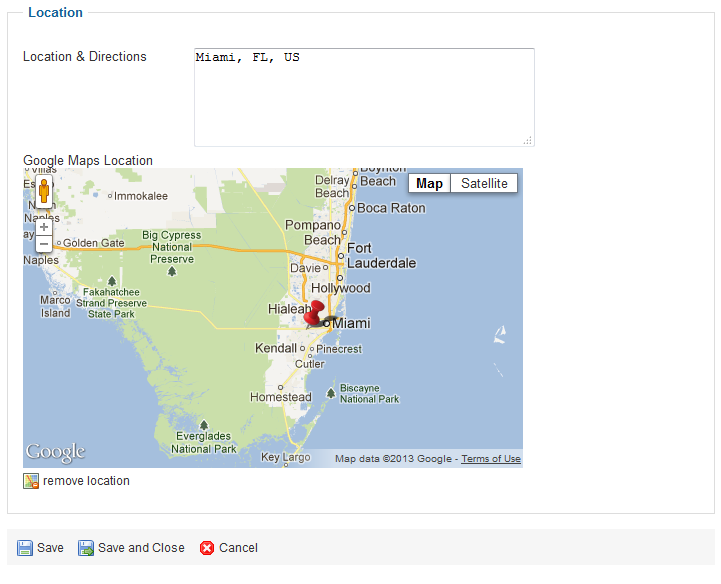 Here you can add more informations about you like your location, height or a description. Clicking on the key button will allow the user to set the respective field to be visible by only him, his friends or everyone. Below, you can add your college/university or the graduation year. You can hide your profile from other users by setting the Profile Privacy, you can set the profile public, just for friends or offline. From this area you can also delete your profile. 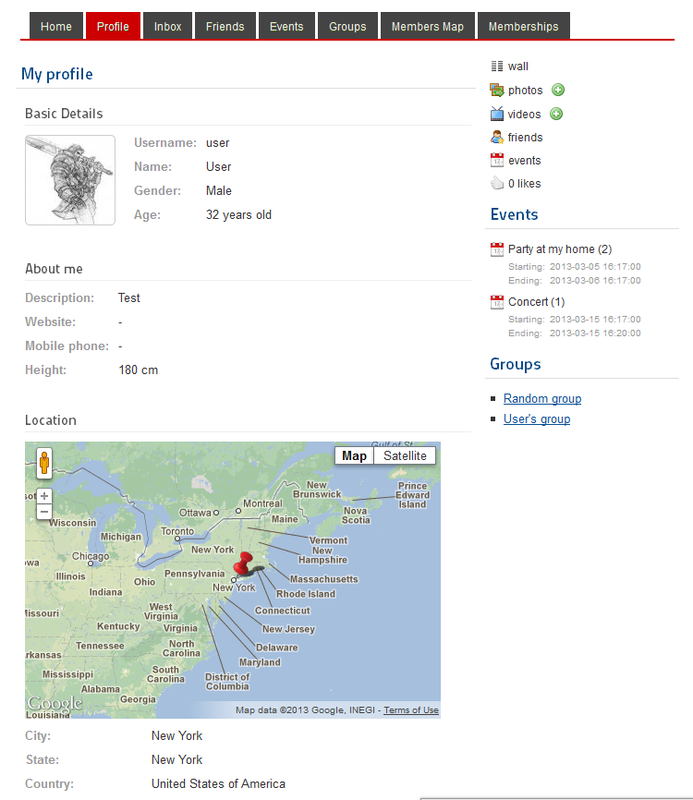 This is how the profile will look like after the changes and with some events and groups joined. Click on Wall to view that section. Here you can share with your friends what's on your mind, the message will appear on their home page and they will be able to like it or to respond. Click on New Album and add a title and a description for your new album, then click on Submit Query. Now that you have an album you can upload photos and select an album cover or a profile photo. To upload a photo click on the button and select the photo from your system, then you can add a description or make the selected photo the album cover. Click on Confirm photos to finish. Once you uploaded the photo, other users can like, comment or report it. Here you can check your video gallery. To proceed adding a new video click on add new and include your embed code. 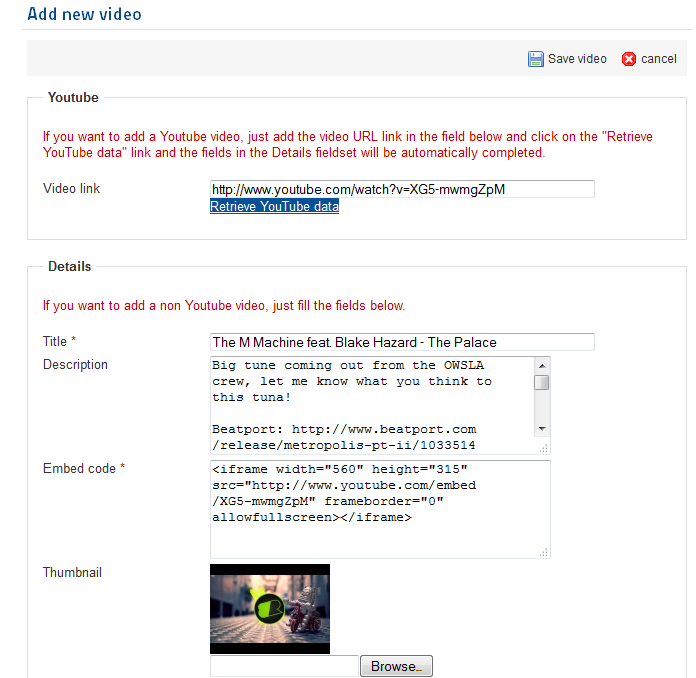 To add an YouTube URL and click on Retrieve YouTube data, this will fill automatically all the required fields. Click on Save video to finish. Other members can like or report your videos. To delete it simply select it and click on delete. To see the received message click on the title. To reply click on Compose reply and write your message. On the Outbox area you can view the messages sent by you and to delete them if necessary. By clicking on the title of an event you can see all the information related to it. Here you can see the exact time till the even starts and when it will finish. You can check the location and who are the attendees and also to comment or like the event. 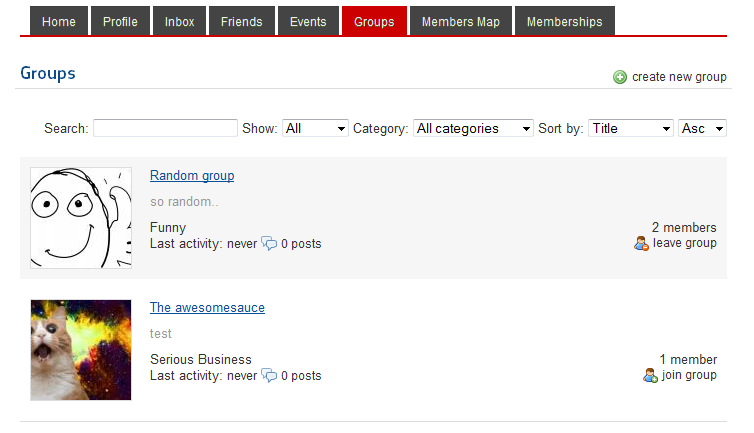 Below all these you will find an activity history that shows you all the comments and who joined or left the event. Here you can check all the interactions sent to you and the ability to respond back. The "smile" interaction is the default one but many more can be added by the administrator if desired. 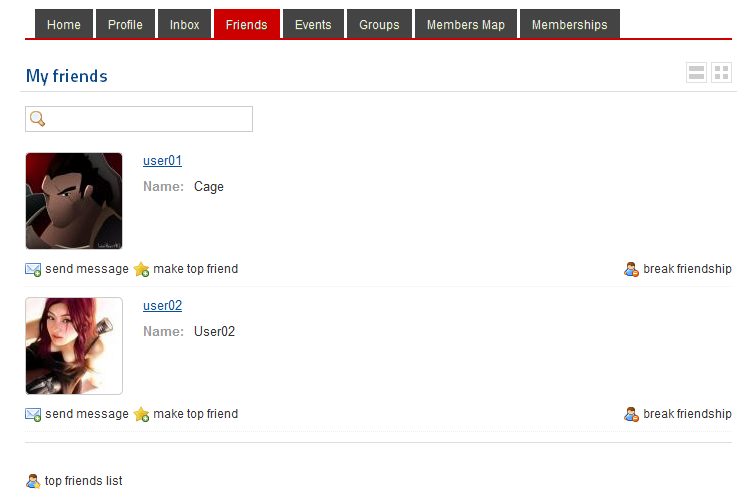 On the Friends tab you can view a list of all your friends and send them messages or make them top friends. As top friends you should add the ones closest to you. From this submenu you can send them messages or remove them from the top friends list. You can search for new friends using the Search submenu, here you will find all the registered users that don't have their profile hidden. You can ignore abusive or rude users if needed by accessing their profile pages. On the Events tab you can view the events you are attending to and create new ones. 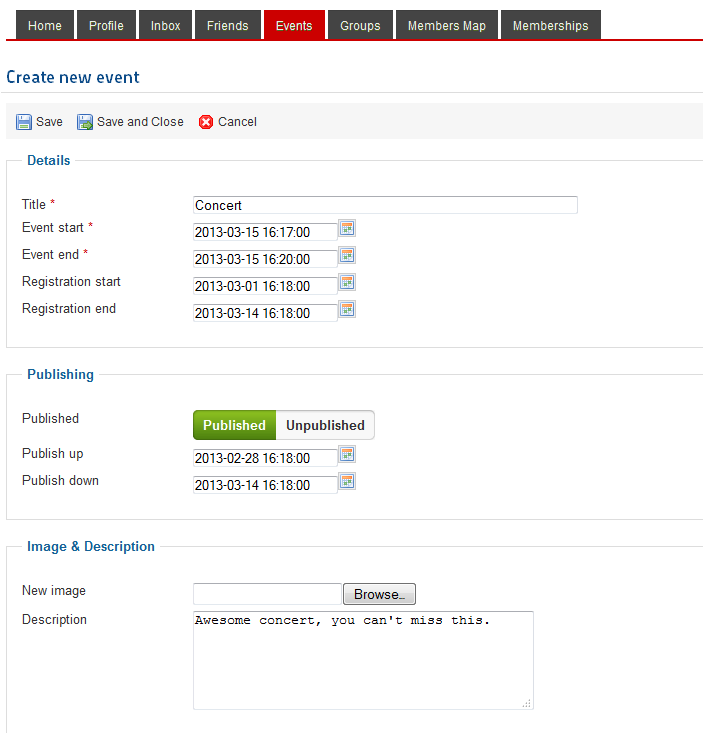 Now to add the details regarding the event, add a title first, preferably mentioning the type of event. Add date and time for when the event stars and ends. Add date and time for when the registration for this event starts and when is the deadline. On the Publishing area you can choose to make it visible(publish it) only from a specific date. 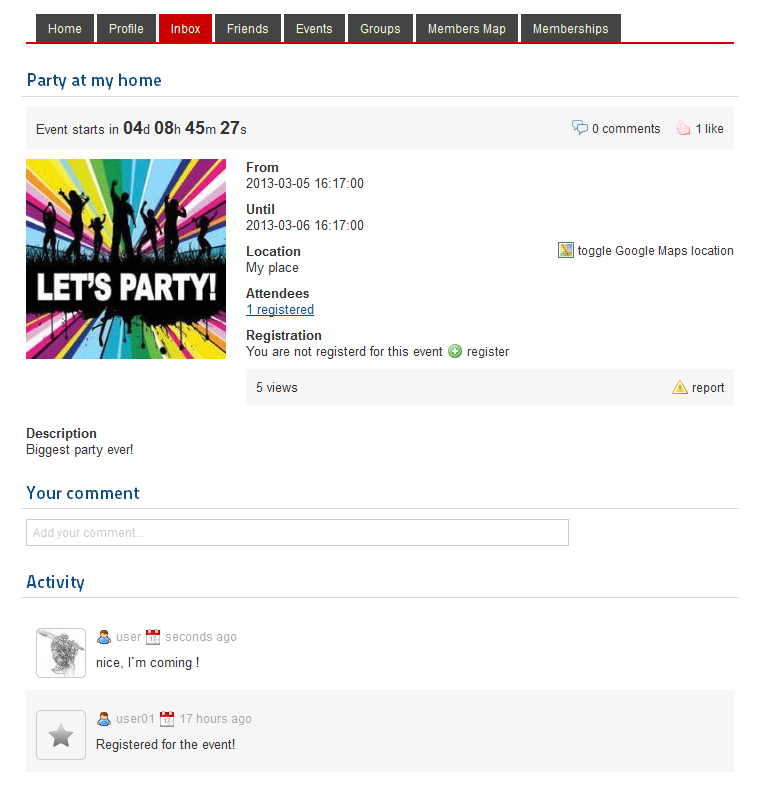 Image & Description allows you to add a logo for the event and a description where you can add details about it. Below all these, you can add details about the Location. To make the location even easier to find you can add it using Google Maps, simply zoom in and pinpoint where the event will happen. 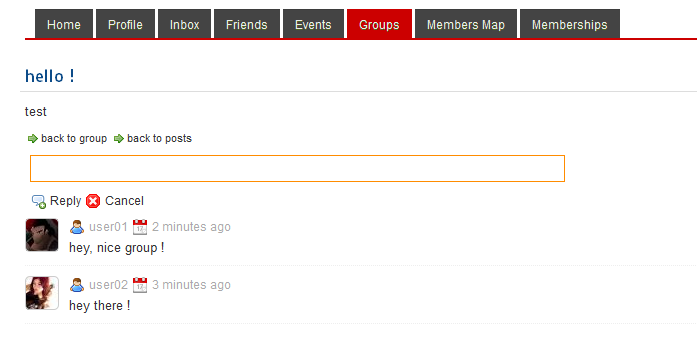 On the Groups tab you can view all the groups already made or to create a new one, click on create new group to do so. 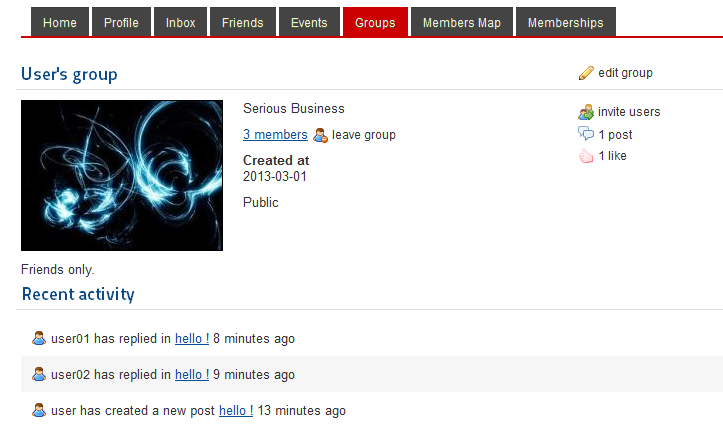 When adding a new group you can set some details regarding it. Add a Title and a Description for it so other users will know what is this all about. You can select a category for it, the group categories are added by the administrator in the backend so the list will vary here. 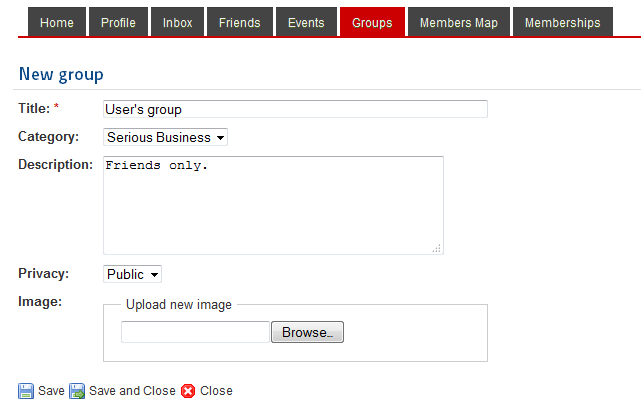 You can set the Privacy for your group, Public or Private. In case you want your group to attract more people and to look better upload an Image. By going to your group's main page you can change the settings with the same form you created it clicking on edit group, additional option being to delete the group. Clicking on invite users will pop up a window where you send invitations to multiple users writing a title and a description. Every group has a room where users can post messages, by going to a post you can reply on it or view other user's replies. On the main page of the group you will also find a like button which also displays how many likes were given and a recent activity showing a short history of the recent posts and comments. 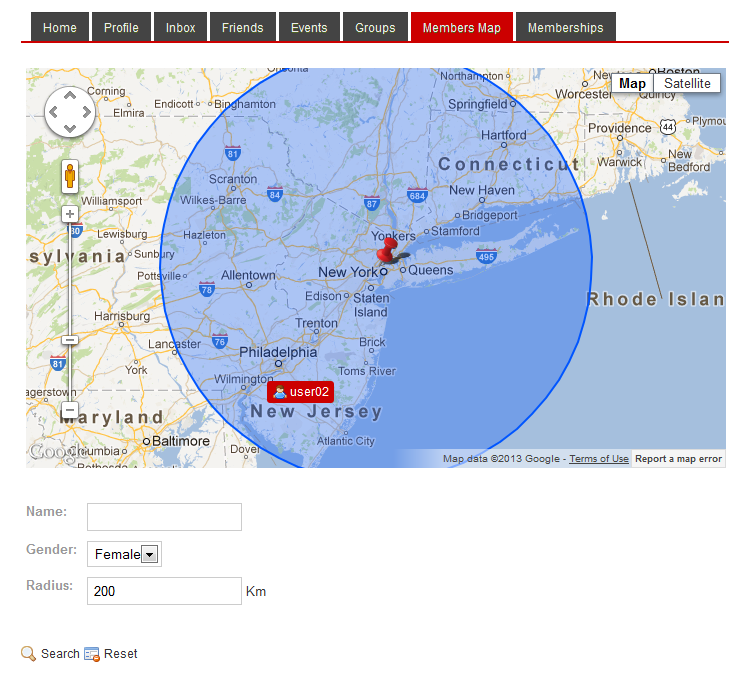 The place shown with a number on the map means that there are more users in a close proximity so they have to be grouped to avoid overlapping - Zoom in to see them all. 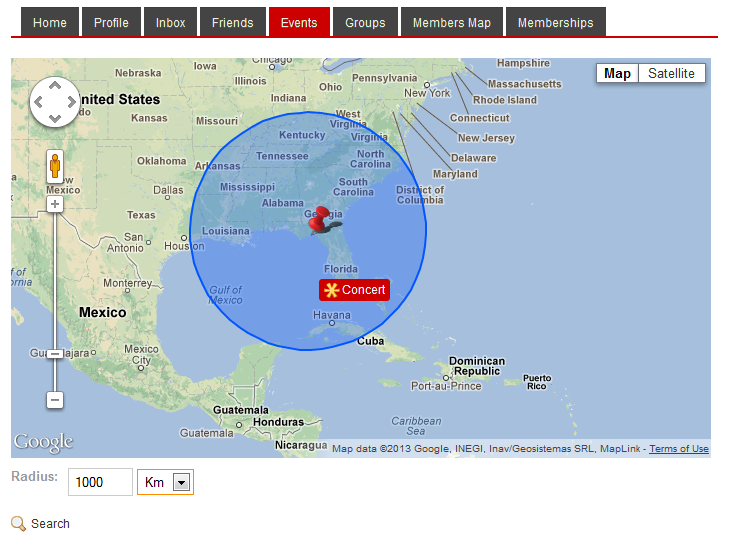 In the Radius Search submenu you can search the users by location using Google Maps. You can filter the search by gender or name. The bar will have to be enabled by the administrator from the backend and if so it will be visible on every page you visit. Layout and fields will vary a lot depending on each configuration, this documentation is based on the default installation. 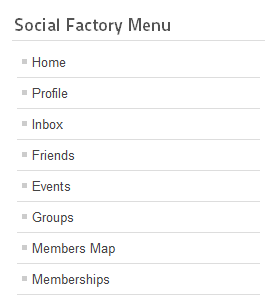 To see how you can configure your Social Factory Component, see the custom fields section.